Yep. That’s how mercy is. The title may or may not be alluding to Waffle House, and this might read as a weird advent devotion. Follow me here, though. The food at Waffle House is delicious. You eat as much as you want for about eight bucks, and you feel icky afterwards. You feel icky walking inside because it’s usually freezing, you order the all-star classic hoping that they get your order right the first time, and you chow down on a blueberry waffle, some bacon, and those greasy, smothered & covered hashbrowns like you haven’t had a meal in four days. Then you pay and walk outta there with no more regard to holding in your belly as you waddle quickly to the car so you can loosen your pants. Encounters with mercy are like this. You feel awkward because you know you don’t deserve it, but you readily receive it, and then after you’ve enjoyed your fill of mercy, you start to feel that icky awkwardness as you experience the bliss that comes with having been forgiven. In the moments when you receive mercy, you probably feel like the scum of the earth, but then as you begin to realize the beauty of being forgiven, you have no choice but to experience bliss and joy because of such mercy. The enemy wants to keep us from enjoying the forgiveness that we’ve received through Christ. The enemy wants to keep us in a perpetual state of guilt so that we miss out on the fulfillment that comes from God’s mercy and loving kindness. However, why would God want us to experience mercy and then constantly feel guilty about it? He wouldn’t! That’s the whole point of the cross, to remove our guilt (real guilt and false guilt). Okay, well the cross accomplished more than that, but the point here is that God does not want us to stay in a perpetual state of guilt. 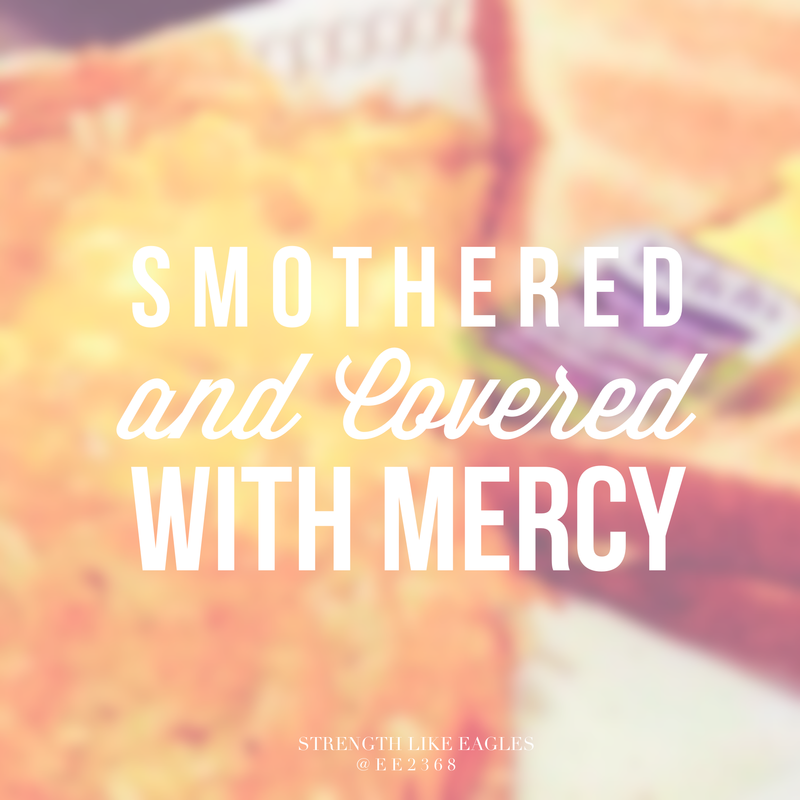 So, the next time you enjoy a plate of hashbrowns smothered and covered, think of the mercy you’ve received from Christ, acknowledge the ickiness, and move past it. You have been shown great mercy. Go live it.